With an RSS Feed Email Campaign, you can send new posts to your audience whenever you publish content. This makes use of our API Triggered Broadcast campaigns and a Zapier workflow. Follow the instructions in How to Set Up an API Triggered Broadcast, steps 1-4. Once you're in Zapier, click "Make a Zap!" in the top menu to get started. Here's the code we used, which may vary depending on your date format. For the Input Data field, enter "body" and then from the dropdown, we were able to select our raw content text, which allowed Customer.io to parse the HTML as-is in the designed email. In the final Zapier workflow step, choose the built-in app "Webhooks by Zapier" to send a webhook to Customer.io. Create a "Custom Request". In the "Edit Template" step, choose POST as your HTTP method. 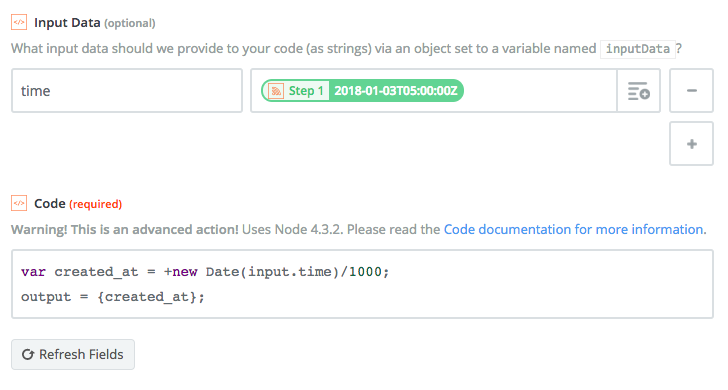 In the "Data" step, we'll add our data, in JSON format. In our example, we're adding headline, date, and text data, as well as defining our recipient segment. Here's some more information on how to format this broadcast data! Select "no" for the "Unflatten option". Next we'll add our basic auth credentials by filling in our site ID and API Key using | as a separator. In the "Headers" step, fill in "Content-Type" and application/json" as the key, value pair. 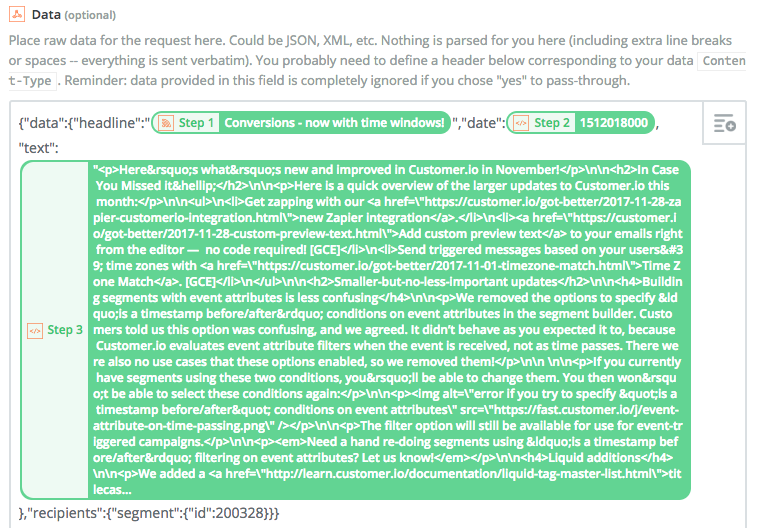 API Triggered Broadcasts are a great way to save time for recurring messages like blog post updates. If you have questions about how to apply this recipe, let us know!